Mike Pease, local event chairman for the DCI World Championship Open Class Quarterfinals in Michigan City, Ind., submitted this photo and caption. 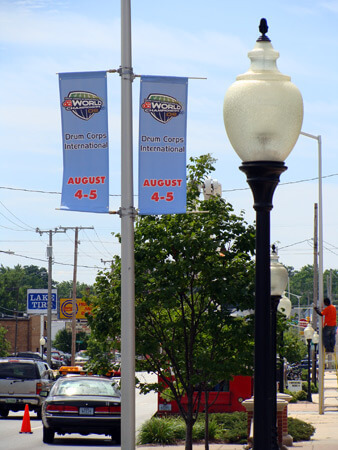 This photos is of the banners that are hanging along the streets of Michigan City, Ind. as the city gets ready for the Open Class Quarterfinals. The official opening ceremonies are Monday, Aug. 4 and the competition begins on Tuesday, Aug. 5. "Banners, Balloons & Booms" is the theme. The banners are up. Don't miss the balloon release at the opening ceremonies. And the two days will end with a spectacular fireworks (booms) show! Learn more about the Open Class Quarterfinals.